England's 2018 World Cup bid team has added its condemnation to the violence at Tuesday's Carling Cup match between West Ham and Millwall. There were three pitch invasions during the match and large-scale trouble around Upton Park before and after. "It is extremely disappointing," said a bid spokesman. "A tiny minority have deflected from the passion and dedication that millions of genuine fans show every week for our national game." England faces competition from Australia, Japan, the USA, Russia, Mexico and Indonesia, as well as joint bids from Netherlands and Belgium and Portugal and Spain, in the race to host the 2018 competition. Is violence at football matches on the way down, despite events at Upton Park, and do all these stats reflect your experiences at matches? The sport's governing body Fifa is due to make a decision on a winner in December 2010 and the bid team is keen to stress English hooliganism is in decline. "The scenes from Upton Park were a regrettable but isolated example of a culture that the football community has worked tirelessly to eradicate from our game," the spokesman added. The Football Association also insisted the violence should not be seen as typical of crowds in England. "We are seen as one of the leaders, if not the leader, in the way that we have tackled hooliganism and disorder in our grounds over the past 30 years," Adrian Bevington, the FA's director of communications, told BBC Radio 5 live. "We receive communication from South America, from Fifa, from Uefa and other European countries asking for advice. "That doesn't mean that we're sitting here saying we've got it all sorted. "Clearly on what we're seeing last night shows there are still times when we have problems to deal with." 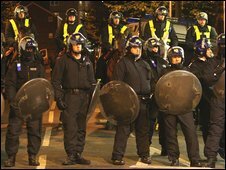 Of the 37m people attending football matches in England and Wales in the 2007-08 season, 3842 were arrested for disorder connected to matches. The figure represented an increase in those held, both overall and for violent offences, on the previous year. But the number of arrests over the past four years are at the lowest since records began.